By the time you use one of our products, the oil has gone through about 90 tests to ensure the highest quality. Before we even plant one seed at a Young Living farm or a partner farm, our scientists test the soil, water, and other environmental factors to make sure everything meets our standards. Our oils can be used in a wide variety of ways! They’re wonderful for aromatic uses like diffusing Purification® to banish musty odors, inviting the sunny aroma of Lemon into your home on a rainy day, or helping your child get ready for bed with the soothing aroma of Lavender. They’re also great to use topically, including dabbing R.C. on your wrists for a fresh scent, using Peppermint for a refreshing foot massage, or adding a few drops of Frankincense to your nighttime moisturizer. 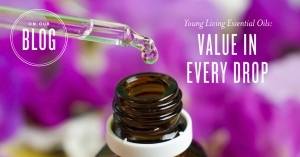 Our Vitality oils are a great way to enjoy the internal benefits of our oils. Try taking DiGize Vitality before a meal to support your wellness regimen,* or use a few drops of Grapefruit Vitality to add a boost of fresh flavor to your favorite foods and beverages!